Anne was born to poor parents in Germany. 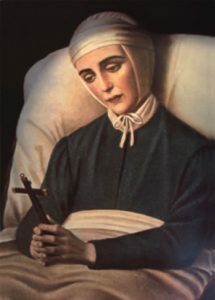 She was pious and, while she suffered poor health, she received visions and prophecies which she thought were normal and experienced by other children. She demonstrated an uncanny ability to diagnose illness and recommend cures, as well as seeing a person’s state of soul. 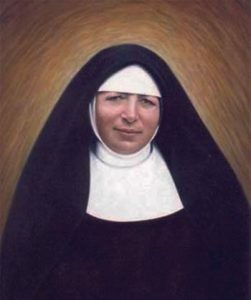 She worked on her family’s farm until she entered the Augustinian convent at Agnetenberg where she was content to be regarded as the lowest in the house. She often went into ecstasy in church, in her cell, or while working. The convent was closed by the government in 1812, and Anne moved in with a poor widow. Her health failed and, instead of working as a servant, she became a patient. Her visions and prophecies increased, and in 1813 she received the stigmata with wounds on her hands, feet, head and chest. She lived off nothing but Holy Communion for the rest of her life. In 1818, she was relieved of the wounds in her hands and feet, but the others remained, reopening on Good Fridays. A written record of the revelations she received were published from 1833 onwards. Her mission seems to have been, through her prayer and suffering, to aid the Church in restoring discipline and strengthening the faith. Saint Anne, teach us the blessings of humility. was born in Kaltbrunn, Switzerland. Unusually intelligent, she was raised with loving care and in sound Christian faith which developed into an intense love for Jesus Christ and devotion to Our Lady. She shone academically, and the world lay open to entice her, but she heard the call of Jesus and decided to embrace the religious life. In 1880, she entered the enclosed Franciscan convent of Maria Hilf, where she was clothed with the habit the following year, receiving the name Mary Charity (Maria Caridad) of the Love of the Holy Spirit. Following her profession, she was designated to teach at the convent school. When the Bishop of Portoveijo, Ecuador, asked the religious of Maria Hilf for volunteers for his diocese, one of the most eager was Maria Caridad. In 1888, she and her companions set out for Chone, Ecuador. Five years later she was sent to the foundation in Tùquerres, Colombia. There her missionary zeal came to the fore. She was concerned above all with the poor, the outcasts, and those who did not yet know the Gospel. Mother Maria died in Pasto, Colombia, and her grave has become the destination of constant pilgrimages. Blessed Maria, instil in us a missionary spirit. Born in Sicily, Leo had been a Canon Regular and was a devout student of Holy Scripture, being well versed in Greek as well as Latin. In his day, grave difficulties frequently arose between the Holy See and the emperors of Constantinople, who wanted control of the hierarchy. Leo published a decree ordering that in the future no bishop of Ravenna could enter into his function before being consecrated for that office in Rome, by the Roman Pontiff. Leo was highly gifted in the domain of music, and he renovated the Gregorian library, then in a state of confusion. He also composed new hymns, still conserved by the Church. He took special care of widows and orphans and the poor in general, relieving their sufferings with a truly apostolic charity. When he died, his death was deeply regretted by all the faithful. 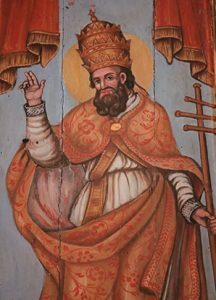 Saint Leo, increase in us a love of the liturgy.